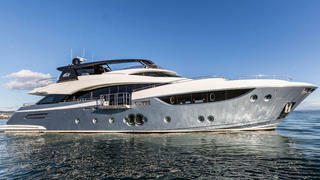 The second hull in the Monte Carlo 105 series has been launched, a 32 metre yacht called Serendipity. Styled both inside and out by design duo Carlo Nuvolari and Dan Lenard, the new Monte Carlo Yachts 105 was built in Trieste and successfully completed its sea trials back in March. The light blue hull and white superstructure contrast with the all-grey exterior of G, the first model in the flagship series, which was launched last year at a gala event in Venice. Serendipity’s dynamic exterior styling is immediately recognisable and evokes the smaller models in the Monte Carlo Yachts range. The designers paid particular attention to her exterior spaces, with the aim of emulating much larger craft. Key features include a fold-out balcony, raised pilot house and Portuguese deck, while extensive glazing ensures great visibility and natural light throughout. What’s more, the extended flybridge is described by Monte Carlo Yachts as “unmatched in its class”. The layout features a full-beam master cabin on the main deck along with four guest cabins below decks and three crew cabins in the stern. The MCY 105 has already proven to be a highly popular design, with the four more hulls sold, two of which are expected to be delivered before the year is out.